Nature London’s origins date back to 1864, when William Saunders, a London pharmacist and naturalist, and several of his contemporaries founded the London Branch of the Entomological Society of Canada. The society changed its name to the Entomological Society of Ontario after Canada West became the Province of Ontario. Entomology, the study of insects, was particularly popular in Victorian times, and the society flourished. In fact, from 1872 to 1906, London operated as the “Entomological capital” of Canada. Venues for meetings included members’ homes, often that of William Saunders at 380 Dundas St (1864–1867; London City Hall on Richmond Street (1867–1872); 216 Dundas Street (1872–1880); Victoria Hall, 394 Clarence Street (1880–1896); Y.M.C.A., 429 Wellington St. (1896–1904); and London Public Library, 305 Queens Ave (1904–1906). William Saunders had five sons, all of whom distinguished themselves in their fields of work. The eldest, William Edwin (1861–1943; referred to as W.E. 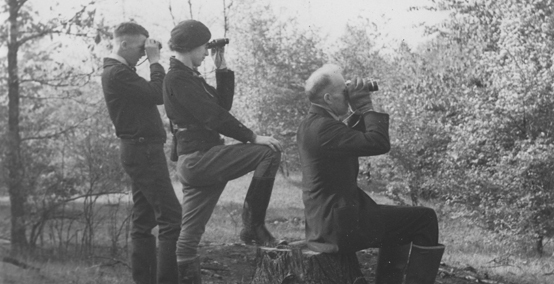 Saunders below) became a driving force in natural history and conservation in Ontario. He was an outstanding ornithologist, mammalogist, horticulturalist, nature lover and conservationist. In 1890, W.E. Saunders became the founding president of the Ornithological Section of the Entomological Society of Ontario when the Society broadened its interests to include sections on botany, geology, microscopy and ornithology. In 1902, the ornithological section, in a move spearheaded by W.E. Saunders, changed its name to the McIlwraith Ornithological Club, to honour Thomas McIlwraith of Hamilton, Ontario’s foremost ornithologist at the time. The new name came into effect in 1903, and, in later years, was also popularly known as “the bird club”. W.E. Saunders remained the most prominent member of the ornithological section until his death in 1943. By 1904, interest in all four sections of the society had waned, and active operation had ceased. In 1906, the parent Entomological Society moved its headquarters to the Ontario Agricultural College at Guelph. For a number of years London had no natural history organization that held formal meetings, though members of the ornithological section continued to associate, go on field trips, and maintain bird records. London’s annual Christmas Bird Count, first organized by two local school boys in 1909 and now part of the Audubon Christmas Bird Count, eventually came under the McIlwraith group. Today it is the longest continuously running count in Canada. In 1915, the McIlwraith Ornithological Club, the only section of the Entomological Society to survive the 10-year hiatus of formal meetings, was reorganized and has met continuously ever since. With the popularity of natural history increasing, the club changed its name in 1965 to the McIlwraith Field Naturalists. A constitution was adopted in 1970 and, in 1972 the club became an Ontario corporation, The McIlwraith Field Naturalists of London, Ontario Incorporated. It is a not-for-profit charitable organization registered federally. The club’s motto is To Preserve and Enjoy Nature. Its mandate is fourfold: 1) To acquire and disseminate knowledge of natural history; 2) To conserve wildlife and to protect its natural habitat; 3) To stimulate public interest in and understanding of nature and its protection and preservation; and 4) To develop and sponsor special interest groups in the fields of natural history. Meeting venues of the McIlwraith Ornithological Club and its successors have included members’ homes, the Collegiate Institute, Normal School, Y.M.C.A., London Life, London Public Library on Queens Ave (1940–1996), First-St. Andrew’s Church, various temporary venues, and the Civic Garden Complex on Springbank Dr. (1998 to the present). In 2009, the club changed its public name from McIlwraith Field Naturalists to Nature London to reflect its location and inclusiveness of naturalists in the city. Aside from the fact that Thomas McIlwraith, for whom the club was named in 1902, was not a Londoner, the former public name presented problems with both pronunciation and spelling. McIlwraith’s great-grandson Thomas F. McIlwraith heartily agreed with the “very sensible name change” to the public name of Nature London, and said the club would be “relieved at that simplification, as well as giving London the focus it warrants.” The business name of the corporation remains The McIlwraith Field Naturalists of London, Ontario Incorporated. WHAT DOES NATURE LONDON DO? For many years the focus of meetings was on films, slides and discussions of birds with a gradually increasing interest in other aspects of natural history and conservation issues. Field trips were, and continue to be, important components of the club’s activities. The Birding Wing, which meets on a separate night from general meetings and represents one of the strongest interests of the club, was created in 1988. At various times over the years, the club sponsored Audubon film nights, a non-credit course in natural history at Fanshawe College, a junior naturalists’ group, Trees for London (planting of native trees and shrubs), and local and regional reptile research and protection initiatives. Four editions of the club’s popular Guide to the Natural Areas of London & Vicinity, edited by Shirley Lorimer, were published between 1995 and 2007. Nature London has also teamed up in recent years with the Rotary Club of London West to buy and engrave planks for boardwalk installation by the Upper Thames River Conservation Authority at the Westminster Pond/Pond Mills ESA. Initiatives spearheaded by individual Nature London members have included Project Peregrine (monitoring London’s downtown falcon family), the Skunk’s Misery Butterfly Count (since 2000, held annually in July as part of the North American Butterfly Association’s census), SwiftWatch (a program initiated in 2004 to promote Chimney Swift conservation and monitoring, and which has since been adopted by Bird Studies Canada), and Nature in the City (an annual lecture series co-sponsored by the London Public Library, with eight seasons completed as of 2013). A conservation committee was established in 1966, and an archives, located at the Central Branch of the London Public Library, in 1967. In 1983 as part of its commitment to conservation, Nature London officially opened its 11-hectare nature reserve, Cedarcroft, alongside the Thames River south of Delaware. It continues to be a little nature haven, and is managed by a team of members. In 2000, Nature London members and other individuals became founding members of the Thames Talbot Land Trust (TTLT) with financial assistance for start-up provided by Nature London. The TTLT “seeks to conserve lands and waters that contribute to the region’s natural, agricultural or cultural heritage” (B. VanDenBelt in The Cardinal No. 180, August 2000). “Thames makes reference to the area’s dominant natural feature, the Thames River, while Talbot, referring to Colonel Thomas Talbot and Talbot Trail, speaks to the historical dimensions of settlement in the region.” The TTLT is a now a federally incorporated not-for-profit charitable organization, and is affiliated with OLTA and CLTA. Nature London maintains close links with the TTLT. The first issue of the club’s magazine The Cardinal was printed on April 9, 1951. Silk-screened covers were used in early issues. Production of the magazine has progressed from laborious stencil-making, Gestetner duplicating, photo-scanning, paste-and-stick layouts over a light table, manual collating and stapling to using word processing and layout software on computer, and printing done by a commercial outfit. Although copies of original sketches and film photos are still used for some illustrations, digital photography has added a whole new dimension to the magazine. Four issues (flights) are produced annually, including an Index to the previous year’s issues. Occasionally a Supplement dealing with a special topic is published. In recent years, the magazine has averaged 48 pages of interesting material per issue. The editorial committee is undergoing changes, following the retirement of several long-term members, and a whole new approach may be adopted. 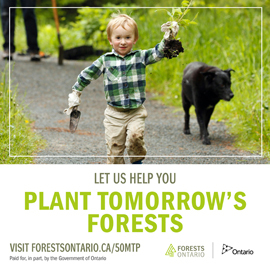 Nature London is affiliated with Nature Canada, Ontario Nature, and several other environmental organizations. 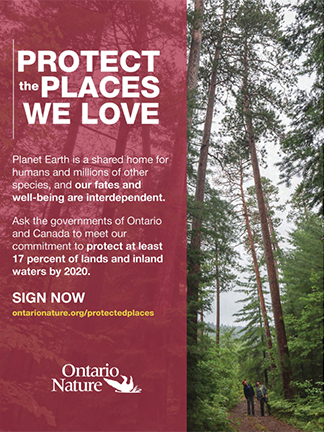 Members of Nature London attend regional meetings of the Ontario Nature Network, and serve as representatives on various other committees and a land trust (Environmental and Ecological Planning Advisory Committee, London Advisory Committee on Heritage, Middlesex County Woodlands Advisory Committee, Middlesex Stewardship Council, Thames Talbot Land Trust, and Urban League). This allows the club to be informed about, and take a stand on, environmental issues at the provincial, regional and local levels. Aside from the Christmas Bird Count, members also participate in Bird Studies Canada’s Baillie Birdathon, and contribute data to other species lists and atlases. Nature London’s Annual Awards Banquet, held in November to recognize conservation heroes and outstanding service by members, is a highlight of the club’s year. Rutter, R.J. (Ed.). 1949. W.E. Saunders –Naturalist. Toronto: Federation of Ontario Naturalists. 66 pages. Pomeroy, E.M. 1956. William Saunders and His Five Sons. Toronto: The Ryerson Press. 192 pages. W.W. Judd. 1979. Early Naturalists and Natural History Societies of London, Ontario. London, Canada: Phelps Publishing Company. 216 pages. Wake, W. A Brief History of Nature London. Nature London Annual Report 2010/2011. I have repeatedly had close encounters with the following pair of birds, which I cannot identify. Male almost completely black, red tinge over head and neck. Smaller than a robin, larger than a finch. Not having visual aids makes this case difficult to clearly identify the species – do you have a photo which could help in further identifying these birds? Perhaps they are catbirds, kingbirds or even American redstarts?